A comfort to many in World War I, Frank Halliday Ferris was born to Edwin Sherwood Ferris and Mary Halliday in 1892, in Brooklyn, New York. He was a sixth great-grandson of Jeffrey Ferris through his son, Joseph. Ferris served in the U.S. Navy from Jan. 3, 1918 to April 25, 1919. He was a Lieutenant (junior grade) (LTJG) in the Chaplains’ Corps, as a Presbyterian minister. 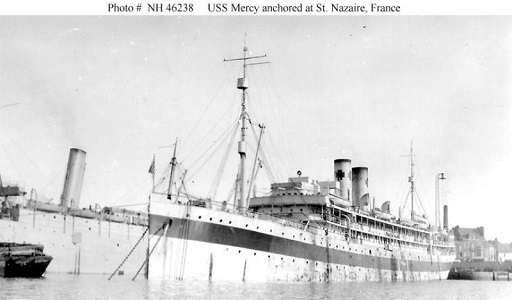 Much of his service was aboard the hospital ship Mercy, and also aboard ships transporting wounded from the war in France. At the end of his service, he served aboard the battleship USS Texas during winter target practice in the Caribbean. He was based out of Guantanamo. The military information is found in his own writing on a form submitted to the local historian of the Town of Richland, Oswego County, New York, and found online. At the time he was a minister at the First Presbyterian Church in East Cleveland, Ohio. He married Mina Proctor in 1917, and they had four children, two sons and two daughters. He is listed as living in Oswego County in the 1920 Census, in Maplewood, NJ, for the 1930 census and in Ohio for the 1940 census. He died in 1974. He was a writer of note, a long serving minister and a veteran of the war. A man of some accomplishment.